A Markov cohort model assessed the clinical and economic trade-offs of two products (EVG/cobi/FTC/TDF and EFV/FTC/TDF) in first-line antiretroviral therapy in US adults and found that EVG/cobi/FTC/TDF was not cost effective in the base case compared with EFV/FTC/TDF for first-line HIV treatment. The poster can be viewed here. A comparison of healthcare costs and utilization between epilepsy patients treated with Long-Acting and Short-Acting antiepileptic drug (AED) monotherapy found that LA AED users incur a lower economic burden than SA AED. The poster can be viewed here. An evaluation of commercially-insured patients with Cushing’s disease, a rare disorder resulting from excessive exposure to glucocorticoids, found a substantial economic burden in these patients with up to $35,000 incurred annually in overall healthcare costs, of which $31,995 are for medical costs. The poster can be viewed here. According to Andrew M. Kaunitz, MD, Editor in chief of Journal Watch, Women’s Health, a study by PHAR researchers demonstrates that “except in women with mutations that raise risk for ovarian cancer, bilateral oophorectomy should not be performed at hysterectomy for benign indications.” Dr. Kaunitz is is Professor and Associate Chair of the Department of Obstetrics and Gynecology at the University of Florida College of Medicine–Jacksonville. Patients with cystic fibrosis (CF), a common life-shortening inherited disorder, often don’t take all their medications. It has been proposed that better adherence could improve these patients’ health more than any specific medical treatment. Investigators at PHAR, LLC, in collaboration with Genentech, Inc. conducted a retrospective cohort analysis and confirmed that there was generally low adherence to dornase alfa, a key drug for CF. The study also found that better adherence was associated with shorter hospital stays. This publication can be viewed by visiting the Journal of Medical Economics website. A recent study demonstrates that bilateral oophorectomy decreases the risk of ovarian cancer but increases the risk of death from other causes. Researchers from PHAR,LLC; the John Wayne Cancer Institute; USC; Stanford; Brigham and Women’s Hospital/ Harvard; and the University of Auckland conducted a prospective cohort study following over 30,000 Nurses’ Health Study participants for 28 years to investigate long-term health outcomes in women who had either bilateral oophorectomy or ovarian conservation at hysterectomy. Bilateral oophorectomy was associated with increased mortality in women younger than 50 years who never used estrogen therapy, and at no age was oophorectomy associated with increased survival. The full article is now available online ahead-of-print in Obstetrics & Gynecology. An accompanying editorial comments, “Dr. Parker and colleagues have made a significant contribution to our understanding of the effect of estrogen deprivation on women’s health, and they elegantly outline the dramatic increases in mortality.” The editorial is also available online. PHAR researchers collaborated with investigators at Eisai Inc. to evaluate the prevalence of hematologic conditions in patients with myelodysplastic syndrome (MDS). Researchers compared two MDS patient groups: patients receiving hypomethylating agents (HMAs) and patients receiving supportive care alone. The study concluded that hematologic conditions were more common in patients who received HMAs, with the most frequently observed conditions being anemia and neutropenia. 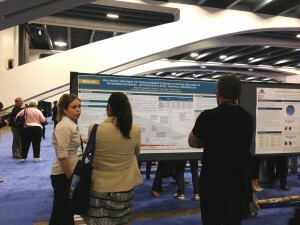 A poster detailing the findings was presented at the 2012 MASCC/ISOO International Symposium on Supportive Care in Cancer. This study was published in the November/December issue of American Health & Drug Benefits and can be viewed here. Physician experts from 10 regionally based academic practices in the US formed an expert panel with the purpose of developing a consensus on the appropriateness of medical therapies for grade 1-2 unresectable neuroendocrine tumors of the pancreas (PNETs). The panel was facilitated using the RAND/UCLA modified Delphi process, a systematic method for group decision making. The panel statements agreed with-and increased the detail of-previously published PNET guidelines. The full results of the expert panel were presented at a poster session of the 94th Annual Meeting & Expo of ENDO in Houston, Texas. PHAR investigators along with experts from Novartis Pharmaceuticals Corporation and Stanford University School of Medicine collaborated to produce comprehensive research on acromegaly, a chronic and debilitating disorder caused by excessive growth hormone secretion. Research topics ranged from the prevalence of acromegaly complications and treatments to healthcare utilization and costs within the United States. The most common complications of acromegaly were musculoskeletal abnormalities, hypopituitarism, sleep apnea, and reproductive system abnormalities. In addition, although acromegaly is rare, annual costs are high with the risk of hospitalization being more than 50% higher in patients with sleep apnea or musculoskeletal complications and nearly three times higher in patients with cardiovascular disease than in patients without complications. Two posters were presented at the 94th Annual Meeting & Expo of ENDO in Houston, Texas, that outline the research findings. An analysis of acromegaly treatment patterns using a novel graphic method revealed patterns of treatment as well as insights about adherence and persistence in the treatment of the disease. An evaluation of treatment patterns for several FDA-approved drugs for myelodysplastic syndrome showed that, among other findings, most patients are given supportive care rather than hypomethylating agents for treatment. A comparison of annual overall and healthcare-related costs between adult patients with stable and uncontrolled epilepsy found that, regardless of disease stability, both are associated with a significant economic burden and that uncontrolled epilepsy is associated with greater costs. A comparison of healthcare utilization between patients with stable and uncontrollable epilepsy found that patients with uncontrollable epilepsy use significantly more healthcare services. An expert panel on the appropriateness of medical treatment in patients with unresectable midgut gastrointestinal neuroendocrine tumors (NETs) developed a consensus for scenarios not covered in other guidelines. An expert panel facilitated by the RAND/UCLA modified Delphi process produced consensus statements on the appropriateness of medical treatment in unresectable non-midgut NETs. According to the Center for Medicare & Medicaid Services, one major goal of health reform is to “lower health care costs through better health care quality.” Improved quality can take many forms-one of them is greater use of simple, low-cost, cancer screening tests, like mammograms. Researchers at PHAR, LLC, the UCLA Center for Surgical Outcomes and Quality, and RAND developed a framework to assess the cost-effectiveness of improving compliance in the US with the Healthcare Effectiveness Data and Information Set, a comprehensive set of quality indicators. The investigators found that improving quality on three cancer screening measures (cervical, breast, and colon) might save lives, but it will not save money. Results were presented at the 2012 American Society of Clinical Oncology Annual Meeting. View the abstract at the ASCO Annual Meeting website ; the poster is available for download here.